Won “best use of Google Cloud Plaform” award at Tamuhack 2019! Often when I open my photo gallery on my phone, I am shocked to find how many pictures are just of powerpoints and homework assignments. In the moment those photos are deemed as necessary, but when you want to just find some memories they become a huge hinderence. The situation above is what inspired us to create noted, an app that was a camera specifically for class notes and reminders. On top of keeping note pictures away from the photo gallery, noted was designed to have features that make taking pictures of notes better. How? Taken photos will be automatically filed away to correct tags based on time of day, and photos will be transcribed using Google’s Cloud Vision API allowing for the ability to search for text found in your note pictures. The app is very minimalistic. All you have to do is select what class you want to focus on and take a picture of notes or PowerPoint presentation. The app will immediately categorize and store the image for you and transcribe the text found on the picture. 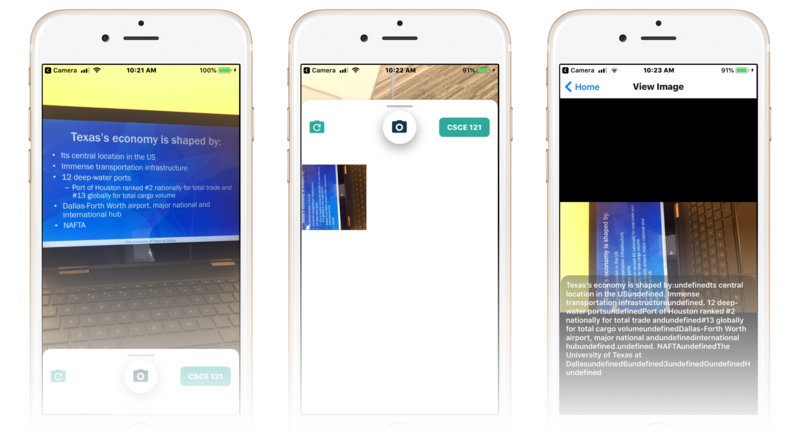 We used react-native (specifically Expo) to create both an Android and iOS app. This allowed all members of the team to contribute code without having a compiler or the same OS. To share code: we used Github (and attempted good branching practices). From the get go, we had to spend an immense amount of time trying to get the project set up and working for everyone. Most of us are pretty new to react-native so things like build errors, merge conflicts, and lock files gave us pretty huge headaches (George actually ended up almost dying from a headache on the first day).